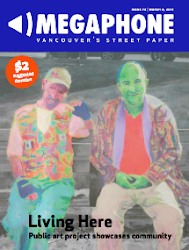 When you mention the Downtown Eastside, a lot of people grimace and focus on the negative aspects of the neighbourhood. Yes, the social problems are acute - drugs, mental illness, and poverty among them. But there are many great reasons to live here. While it can be a hard world here - there is a very strong sense of community among people of virtually all walks of life. Further, many individuals, organizations, and businesses are investing time, energy, and money into this neighbourhood. It is not all doom and gloom. There are many signs of beauty in everyday life here. You just need to be open to seeing them.